Nymphs are essential for successful fly fishing on the rivers throughout England, in fact rivers world over. If there's no hatch and no fish rising then fishing nymphs is often the way to go. Nymphing techniques, of which there are many, should be bread and butter to every fly-fisher. Employing the correct nymphing technique is only part of the solution, selecting the 'right' nymph for the situation is key. River nymphs need to be small, with the correct silhouette and, very importantly, carry the right amount of weight. The weight required might be an un-weighted nymph, a leaded underbody, a metal bead, a tungsten bead, or a combination of lead and tungsten bead. River nymphs with these qualities cannot be bought in shops. Below are the very nymphs that I use for all my river nymph fishing throughout the year. Gold Head Pheasant Tail Nymph is nothing short of outstanding on the Yorkshire Dales rivers. 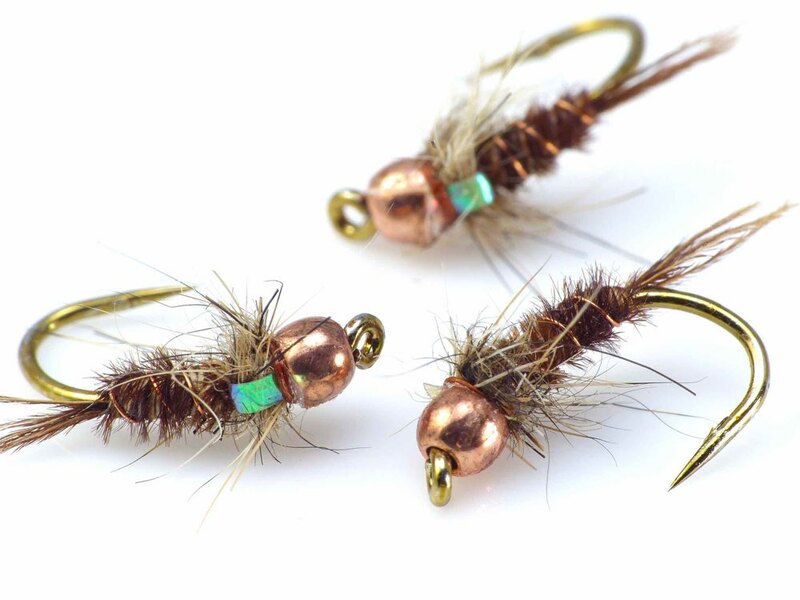 It is a versatile nymph; I use it when upstream nymphing, as a point fly when fishing North Country Spiders and for fishing the 'duo' through shallow water. Once wet this fly looks so natural and juicy it's hard to imagine any trout refusing it! Size 16. The Copperhead Nymph is tied with a tungsten bead and lead under-body to get down quickly. I like to think that it is a representation of a cased caddis. Such a simple nymph but it can be devastating, particularly when Czech nymphing when I use it as a top dropper fly! If I had to use just one nymph this would probably be it! Size 14. An early season nymph originated by my friend Oliver Edwards to represent the Large Dark Olive Nymph. Early season until May, this fly catches lots of trout, fished either upstream or in a team of wet flies. It is an intricate tying (hence the price) and incorporates many features of the natural nymph. Size 14 and 16. A fly from the Scottish competition scene. The body is made from a UV dubbing, which is very attractive to trout and grayling. 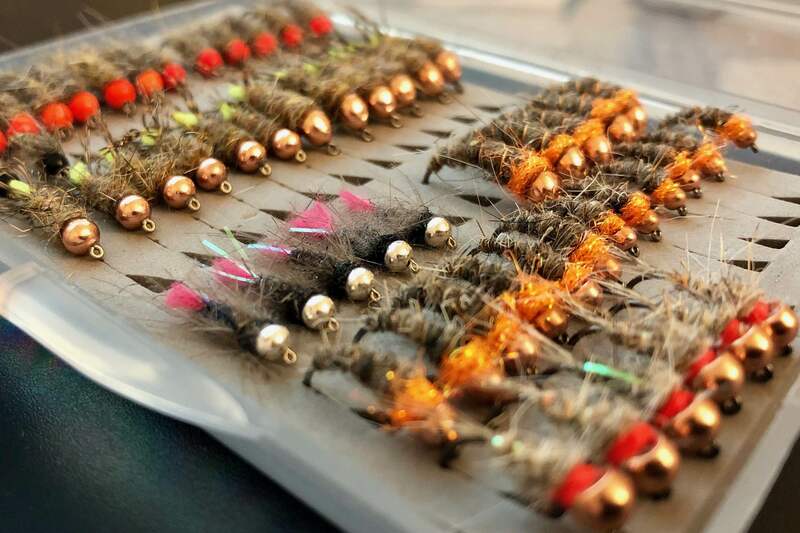 The CDC hackle cloaks the body when fishing giving added movement and translucency to the fly. CDC is becoming quite a popular material for incorporating into nymphs. It traps tiny bubbles of air and its movement underwater imitates gills and legs of a live nymph. Tied with a tungsten bead on a jig hook so that it fishes point up, avoiding snagging the bottom. Highly recommended. Sizes 12, 14 and 16. I started to play around with cat gut in my flies a few years ago and found it to be a very effective material. It gives subtle colouration to flies and just the right amount of translucency. This is a good pattern throughout the summer months and into autumn when the nymphs of the paler upwing species are active. Well suited to fishing on a French Leader. Sizes 16 and 18. Loved by some, hated by others, no-one can question the effectiveness of the Squirmy Wormy! In fact, it is because it is so good at fooling trout and grayling that some anglers dislike it. I'm firmly in the 'love it' camp and a big fan of this fly. Originating in Scotland, it is a favourite of winter grayling flyfishers. It even works on lakes for rainbows. I have caught fish on this fly all over the country; in swollen rivers and low rivers; I've had grayling hit it as soon as it hit the water! It is best fished on a short line, Czech style, or on a French Leader. Available in sizes 8 and 12. This is another tungsten bead nymph tied on the currently fashionable jig hooks. Jig hooks fish point up, meaning fewer snags on the bottom and in my opinion look the part as well. 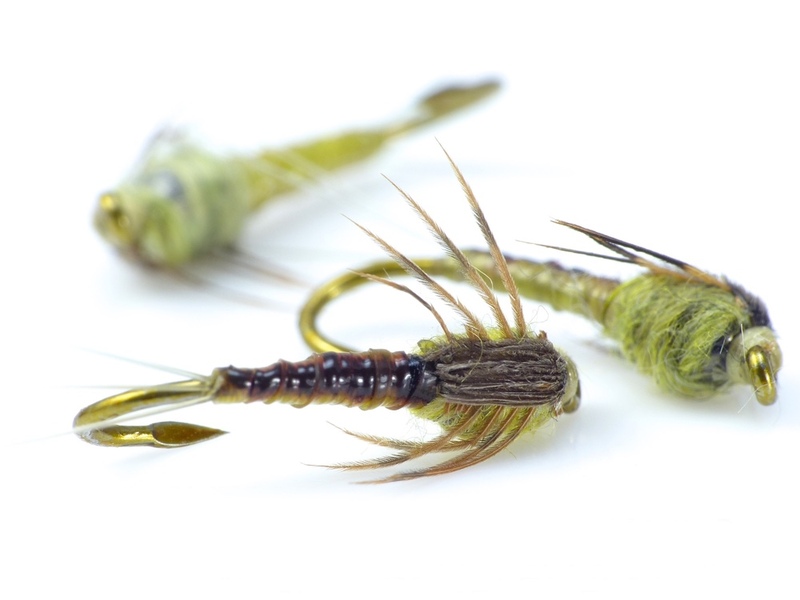 The quill body imitates the segmented body of a nymph and flashy thorax dubbing provides just enough glint to attract trout and grayling. 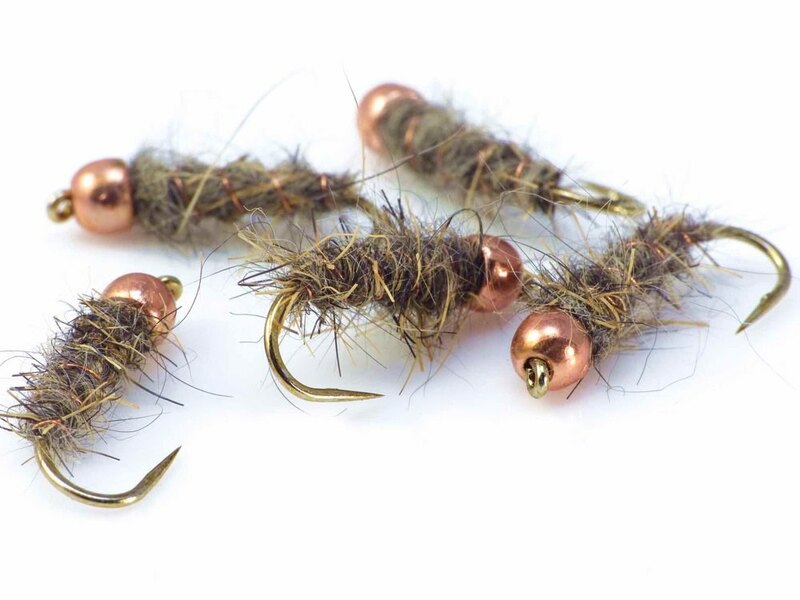 This fly and the Duracell Jig above are both perfectly suited to fishing on French Leaders and the bigger two sizes are perfect for Czech Nymph type (short line) presentations. Sizes 12, 14 and 16. Self adhesive, pinch on, foam bite indicators made by Fulling Mill. These are by far the best strike/bite indicators to use for river fly fishing as they are virtually weightless, give little wind resistance and, therefore, cast well on light river rods/lines. 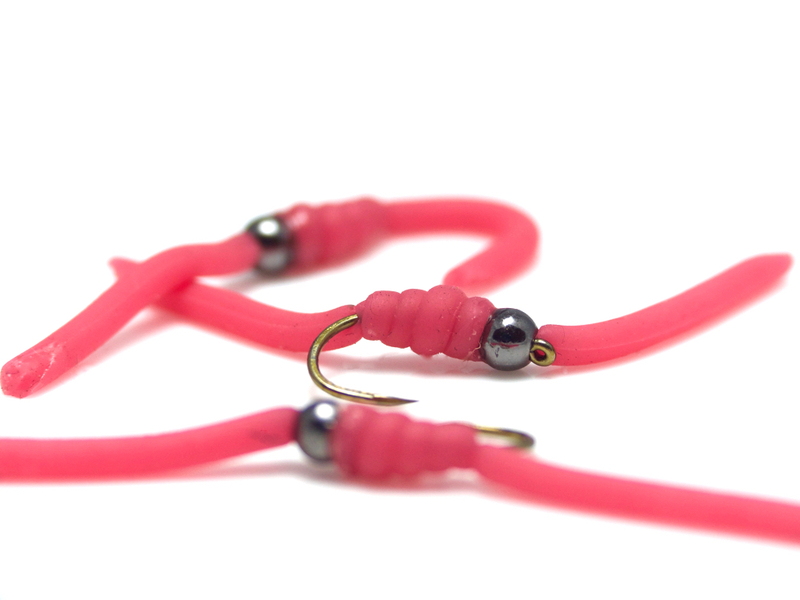 I use them for upstream nymphing by attaching one to the leader where it is knotted to the braided loop. They do not peel, fade or suffer from colour run. The closed cell foam won't get waterlogged like yarn indicators. The aggressive, waterproof adhesive backing, stays on the leader until you decide to remove it - and will leave minimal residue when it is removed. Available in yellow and hot pink - I carry both to cover differing light situations. Each sheet contains 32 punch-out indicators in two different sizes. Useful also for Czech Nymphing. The Sunray WCN Line has revolutionised modern, short-line, nymphing techniques, e.g. Czech Nymphing and French Leaders. Techniques have evolved in recent years, mainly through competition fishing, whereby we fish at close range and hold line off the water to prevent drag and improve presentation. The WCN Line, when fished on a long, light, soft actioned rod, can be cast further and held off at greater range.